WASHINGTON — Michael Flynn, the retired Army lieutenant general and intelligence officer who is Donald Trump’s pick to serve as his national security adviser, is a harsh critic of Muslim extremism and the religion itself, calling “radical Islam” an existential threat to the United States. In strident speeches and public comments, including a fiery address at the Republican National Convention, Flynn has aggressively argued that Islamic State militants pose a threat on a global scale and demanded a far more aggressive U.S. military campaign against the group. In a June interview with CNN, Flynn complained the U.S. needs to “discredit” radical Islam, but that “we’re not allowed to do that right now.” But his comments about Islam, a religion practiced by more than 1.5 billion people worldwide, have at times gone beyond condemning radicals inside the faith. In Flynn’s book, “The Field of Fight: How We Can Win the Global War Against Radical Islam and its Allies,” he condemned U.S. leaders who have called Islam a religion of peace. 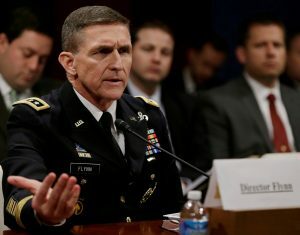 “This insistence on denying the existence of jihad led President Obama to the absurd claim that the Islamic State has nothing to do with Islam,” Flynn wrote. The role of national security adviser has varied by administration, but usually centers on coordinating the policy positions of the secretaries of state, defense, justice and other members of a president’s national security team. It is an especially powerful position because of the national security adviser’s access to the president in the West Wing of the White House. The adviser acts as a gatekeeper on a wide range of issues, including matters of war and peace as well as diplomacy and intelligence. Flynn, who turns 58 in December, served for more than three decades in the Army following his commissioning in 1981 as a second lieutenant in military intelligence. His career included a stint as director of intelligence for the Joint Chiefs of Staff and intelligence chief for the U.S.-led International Security Assistance Force in Afghanistan. It ended, however, when he was forced to resign from his post as head of the Defense Intelligence Agency in 2014 after two turbulent years leading the Pentagon’s top spy agency. Flynn traveled last year to Moscow, where he joined Russian President Vladimir Putin and other Russian officials in a celebration of the RT network, a Russian government-controlled television channel. Flynn later explained that he had been paid for taking part in the event, but brushed aside concerns that he was aiding a Russian propaganda effort. Flynn has became a harsh critic of the Obama administration’s prosecution of the fight against the Islamic State group and emerged as one of Trump’s most vocal backers. Throughout the campaign, Flynn championed many of Trump’s foreign policy provisions, including renegotiating a seven-country agreement with Iran aimed at curbing its nuclear program in exchange for a lifting of economic sanctions. Yet while Flynn has publicly issued dark warnings about the risks of Islamic violence, his private consulting firm has lobbied for a company headed by a Turkish businessman tied to Turkey’s authoritarian, Islamist-leaning government, which cracked down on dissent and jailed thousands of opponents after a failed coup in July against Turkish President Recep Tayyip Erdogan. The businessman, Ekim Alptekin, told The Associated Press on Friday that he had no relationship with Erdogan’s government, even though he is member of a Turkish foreign economic relations board managed by the country’s Economic Ministry. In an op-ed for the Washington newspaper The Hill just before the election, Flynn wrote that Turkey needs support and echoed Erdogan’s warnings that a “shady” Turkish Muslim cleric living in Pennsylvania should not be given safe harbor in the U.S.
Erdogan has accused the cleric, Fethullah Gullen, of orchestrating the July coup attempt and called for his extradition. The Obama administration has not complied. Alptekin said Friday that Flynn’s editorial supporting Erdogan was not connected to his company’s lobbying or the Turkish government. “The Turkish government did not order that,” he said. The Flynn Intel Group also lobbied Congress even as Flynn joined Trump in a presidential intelligence briefing in August – a possible security misstep, according to several ethics law experts. “If the general was receiving classified information that could affect his business interests, that would be an obvious concern,” said Joe Sandler, a campaign ethics lawyer and expert on the law that requires lobbyists for foreign governments to register their activities. Sandler and others also questioned why Flynn’s firm registered as lobbyists with Congress instead of the Justice Department’s stricter Foreign Agent unit, which requires more detailed reporting of activities under the federal Foreign Agent Registration Act. “If a foreign entity is lobbying Congress with the aim of influencing U.S policy, they’re required to file under the foreign agent act,” said Lydia Bennett, an expert in foreign agent work with the non-partisan Project on Government Oversight in Washington. Flynn’s consulting group registered with Congress as a lobbyist in September for Inovo BV, a company Alptekin set up in the Netherlands in 2005. Alptekin said the lobbying project was designed to support an energy firm that he declined to identify.